Aims: To assess the reliability of ultrasound imaging coupled with Color Power Doppler for monitoring the healing after nonsurgical endodontic therapy. Materials and Methods: Ten asymptomatic maxillary anterior teeth with approximately similar-sized periapical radiolucent lesions of average dimension 1.3 - 1.9 cm, as observed on an intraoral periapical radiograph, and confirmed by ultrasound was selected for the study. After confirming the diagnosis all the teeth were subjected to nonsurgical endodontic treatment. Postoperative healing was monitored using postoperative subjective feedback, a radiograph, and an ultrasound with a color power doppler, at intervals of six weeks, three months, and six months. Results: Eight among the ten cases studied showed signs of healing, with an ultrasound, as early as six weeks postoperatively, but the radiographs showed a noticeable change only at the end of three months. At the end of the follow-up period of three months and six months, the findings in terms of change in the lesion size were the same with both the radiograph and ultrasound. Ultrasonography was able to predict the healing very consistently at all recall periods from six weeks onward providing vital information such as changes in vascularity and bone formation as compared to radiographs. Conclusions: Ultrasound with Color Power Doppler is an efficient tool for monitoring bone healing as compared to the conventionally employed radiographic method. This clinical study was designed to asses the reliability of the ultrasound with CPD as a tool for monitoring the healing of periapical lesions at time periods of six weeks, three months, and six months. Ten patients with a noncontributory medical history were selected for this study. 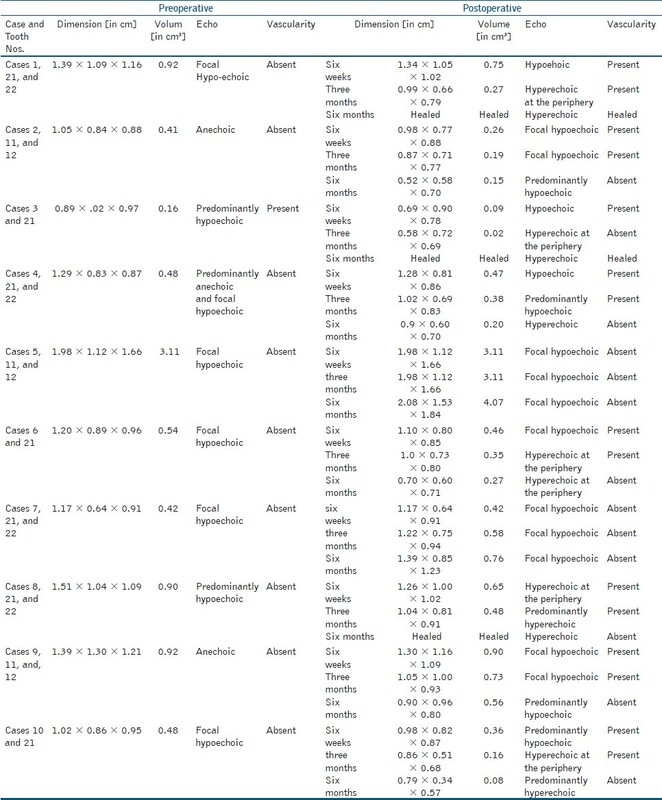 After a thorough clinical examination and radiographic evaluation, patients with asymptomatic maxillary anterior teeth, with approximately similar-sized periapical lesions [average dimension 1.3 to 1.9 cm] of endodontic origin were included in this study. These patients were subjected to an investigation and treatment protocol involving a preoperative ultrasonographic examination followed by a nonsurgical, single-visit endodontic therapy. For the ultrasound technique, the machine used was the state-of-the-art GE Voluson PRO 730. This was a multitransducer system with doppler facilities. Preoperative ultrasound examination was carried out with an intracavitary multifrequency ultrasound probe of 8 - 12 MHz. The probe was first covered with a disposable latex for the control of infection and then covered with a layer of ultrasound gel. The probe was positioned intraorally on the buccal sulcus corresponding to the apical area of the tooth. All lesions were measured in three planes, that is, anteroposterior, superoinferior, and mesiodistal, and the dimensions were recorded. CPD was applied to each examination to detect the blood flow and the information was recorded. The periapical lesions were classified as granulomatous or cystic, based on the findings on USG combined with CPD, as seen in [Table 1]. Nonsurgical root canal treatment was performed on all the patients in a single visit. Pre-procedural mouth rinsing was carried out with 0.12% chlorhexidine before the involved tooth was isolated with a rubber dam. The isolated area was disinfected with 0.12% chlorhexidine. Access opening was done with a sterile bur [Endo Access Bur, Dentsply] at a slow speed, with sterile saline as a coolant. Coronal flaring was carried out with a gates glidden drill. The working length was determined radiographically and was confirmed with an apex locator. It was followed by canal preparation using the hybrid technique-coronal two-third, with a gates glidden drill and apical one-third with the hand K-files. Each file was followed by irrigation with 2 ml of 1% NaOCl in a syringe, with a 27 gauze needle. After completion of the shaping procedure, the canal was rinsed with 15% Ethylenediaminetetraacetic acid (EDTA) solution for one minute, using 5 - 10 ml of the solution. Passive ultrasonic irrigation was carried out with 1% NaOCl for at least three minutes, after completing the canal preparation. , A final rinse with 2% chlorhexidine was used in the canal. Various studies have proved that 2% chlorhexidine significantly reduces the bacterial loads in the root canal. , The master cone was selected on the basis of the master apical file size. The canal was obturated using the lateral condensation method, with zinc oxide eugenol as the sealer. Finally the access cavity was restored with Glass Ionomer Cement (GIC). The patients were followed up after treatment with clinical, radiological, and ultrasonographical evaluation to monitor the healing process at the end of six weeks, three months, and six months. Clinically the patients were evaluated for pain, swelling, tenderness on palpation and percussion, and presence or absence of sinus. All the radiographs were taken using the paralleling technique, with the help of the XCP Rinn instrument and analyzed with the help of the Adobe Photoshop CS image analysis software, and changes in the lesion dimensions were noted ,, [Figure 2], [Figure 3]. Ultrasonographically, the echo changes, changes in the dimension and volume of the lesion, and vascularity of the periapical lesions were observed and recorded. The ultrasonographical examination was carried out by a qualified, experienced radiologist [Figure 1]a-g. The informed consent of all patients who participated in this study was obtained after the nature of the procedure and possible discomforts and risks had been fully explained. Follow up of the periapical lesions at the end of 6 weeks showed no detectable changes radiographically as compared to the pre-operative one. Evidence of healing in the radiograph was noticed only at the end of 3 months, where the size of the lesions had decreased in 8 cases. At the end of 6 months, 3 cases had completely healed, 5 cases were healing lesions and two cases had failed. Ultrasonographically decrease in the size and volume of the lesion was evident as early as 6 weeks post-operatively. Changes in echo and vascularity were also seen in eight cases. By the end of 3 months, further decrease in the size of the lesion and volume and increase in echogenicity indicating healing were observed. At the end of 6 months, 3 patients showed complete healing, 5 cases were healing lesions and two cases had failed. In the present study, the follow-up protocol during the recall period to monitor post endodontic healing included, clinical examination, radiographic examination, and ultrasonographic examination. During the recall period, the clinical examination showed that only two patients, Case Nos. 5 and 7, were clinically symptomatic. The other patients were completely asymptomatic. The radiographic follow-up for all the ten cases, showed no detectable changes at the end of six weeks. Significant evidence of healing was noticed only at the end of three months for eight cases; the lesion size had decreased from the preoperative size, In case of No. 5, the lesion showed no changes and in case of No 7, the lesion showed a slight increase in size, indicative of a progressing lesion. In this study, the ultrasonographic probe was used intraorally to avoid interference of the labial blood supply with that of the lesion. Moreover, extraoral probe placement would be more difficult than intraoral placement because of the interference of the nasal structures. The thin anterior buccal bone and possible fenestration allowed the ultrasound images to be obtained in all the cases and the echo characteristics of the apical lesions were determined. 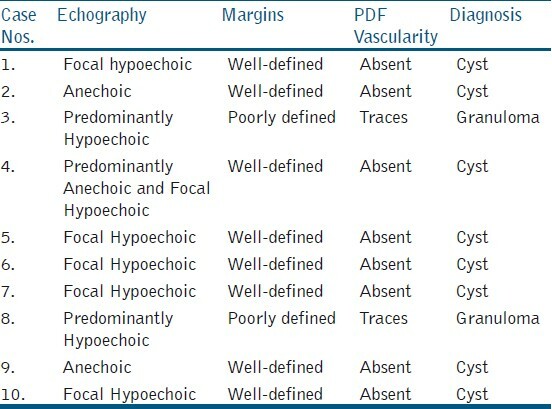 [Table 2] shows that with the help of ultrasonographic examination, changes in size and volume of the lesion, changes in echo, and the presence of vascularity were detectable as early as six weeks postoperatively [Figure 1]c and d for eight cases. The changes detected by ultrasound and CPD in the eight healing cases also included proliferation of the blood vessels (NEOVASCULARIZATION). [Figure 1]d shows signs of neovascularization as denoted by red spicules. This clearly demonstrates that ultrasound coupled with CPD is a superior tool as compared to radiographs, for evaluating post-endodontic healing at the end of six weeks. No changes were seen in cases 5 and 7 at the end of six weeks. By the end of three months, a further decrease in the size of the lesion and volume and increase in echogenecity and decrease in the flow signal [Figure 1]e and f, in terms of vascularity was observed for the eight healing cases. The observed decrease in vascularity is known to indicate remodeling of the cortical plate, which interferes with the CPD signals. Case 5 showed no changes and case 7 shows a slight increase in the size of the lesion. At the end of six months an ultrasound examination of the three patients showed echogenicity comparable to the normal bone in the healing lesion, as seen in [Figure 1]g. This suggests that there was complete new bone formation in that area. The lesion size and volume in the remaining five cases decreased in a manner that could be related to progressive healing. No doppler signal was noted at six months, as is evident in [Figure 1]g. The CPD detects minute areas of blood flow in the healing bone by recording the change in frequency caused by the moving red blood cells. It demonstrates the progressive formation of new blood vessels in the bone during the initial healing period. As bone remodeling proceeds, there is a decrease in flow signals. This is attributed to the decrease in penetration of the doppler ultrasound waves with an increase in bone deposition over the affected region. In contrast, a lack in development of flow signals during the first six weeks may indicate delayed bone healing or non-healing lesions. In this study it was also possible to recognize the initial signs of healing in eight patients, by ultrasonography, in as early as six weeks, by observing the change in the initial hypoechoic regions becoming hyperechoic postoperatively. Ultrasound has an advantage over CT scans, in that it is free of ionizing radiations. , However, the major disadvantage of ultrasound is that it can only be used if there is a bony defect over the lesion, through which ultrasonic waves can traverse. The other limitation of ultrasound is that it cannot be used easily in the posterior region of the mouth as accessibility is difficult with the present probe design. The presence of a thick cortical plate in the posterior region prevents the ultrasound waves from traversing easily. This study confirms that ultrasound real time imaging is a useful imaging technique, which can give significant information in relation to a periapical lesion in the anterior region. USG is easy, reproducible, and convenient to use. The equipment is relatively cheap compared to the other advanced imaging modalities. The images obtained are easy to read once the observer is trained. By obtaining a real time image, a working diagnosis can be made without delay and it also prevents unnecessary exposure of the patient to ionizing radiation. No harmful effects of ultrasound waves have been observed in the tissues as a result of ultrasound examination. As of now ultrasound devices do not have probes specifically designed for intraoral use. In order to make ultrasound more practical, an effective modification of the probe, especially for intraoral use, is required. 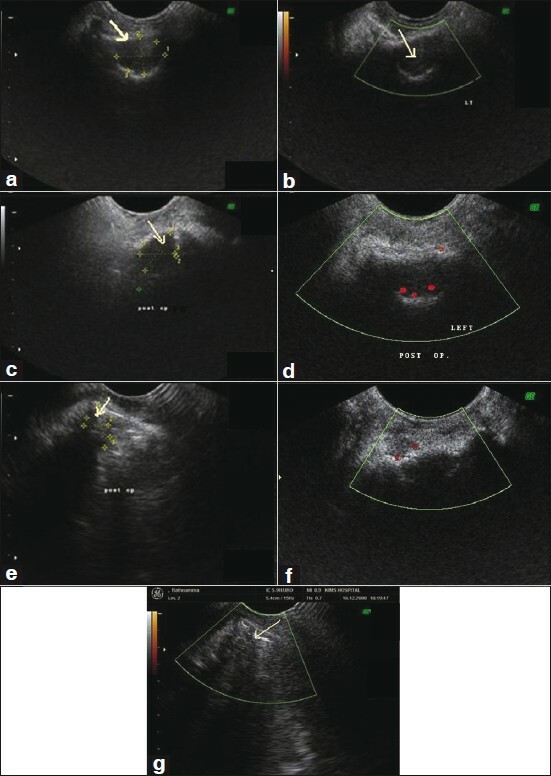 From this study it can be concluded that ultrasound with color power doppler is a very important and efficient tool for diagnosis and also for monitoring post-endodontic healing. We would like to express our deep sense of gratitude and sincere thanks to Dr. N. Meena, Professor and Head of the Department, Dr. Ashish Shetty K.R., Professor, Dr. N. Shubhashini, Dr. Adarsh M.S., Dr. Anjali Kaiwar, Dr. Chethana S. Murthy, Dr. Ranjini M.A., and Dr. Ashwini P. Santosh, Senior Lecturers, who willingly helped with their valuable suggestions and advice in completing this study. 1. Gundappa M, Ng SY, Whaites EJ. Comparison of ultrasound, digital and conventional radiography in differentiating periapical lesions. Dentomaxillofac Radiol 2006;35:326-33. 2. Cotti E, Campisi G, Garauand V, Puddu G. A new technique for the Study of periapical bone lesions: Ultrasound Real Time Imaging. Int Endod J 2002;35:148-52. 3. Cotti E, Campisi G, Ambu R, Dettori C. Ultrasound real time imaging in the differential diagnosis of periapical lesions. Int Endod J 2003;36:556- 63. 4. Rajendran N, Sundaresan B. Efficacy of ultrasound and color power doppler as a monitoring tool in the healing of endodontic periapical lesions. J Endod 2007;33:181-6. 6. Van der Sluis LW, Versluis M, Wu MK, Wesselink PR. Passive ultrasonic irrigation of the root canal: A review of the literature. Int Endod J 2007;40:415-26. 7. Van der Sluis LW, Shemesh H, Wu MK, Wesselink PR. An evaluation of the influence of passive ultrasonic irrigation on the seal of root canal fillings. Int Endod J 2007;40:356-61. 8. Wang CS, Arnold RR, Trope M, Teixeira FB. Clinical efficiency of 2% chlorhexidine gel in reducing intracanal bacteria. J Endod 2007;33:1283- 9. 9. Carvalho FB, Gonçalves M, Tanomaru-Filho M. Evaluation of chronic periapical lesions by digital subtraction radiography by using Adobe Photoshop CS: A technical report. J Endod 2007;33:493-7. 10. Guneri P, Akdeniz BG. 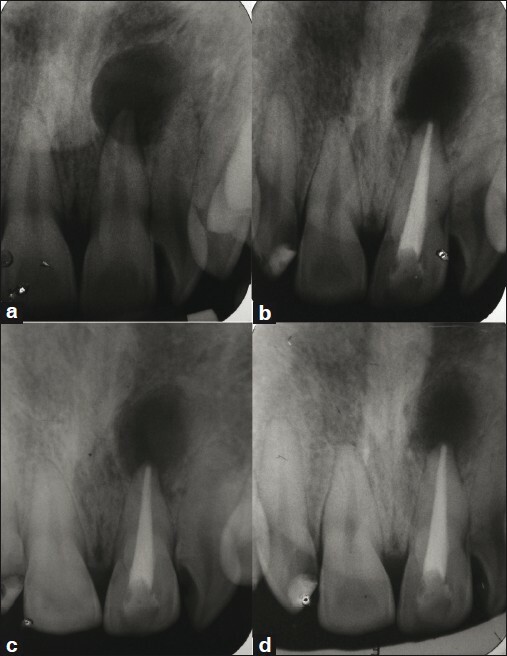 Fradulent management of digital endodontic images. Int Endod J 2004;37:214-20. 11. Mikrogeorgis G, Lyroudia K, Molyvdas I, Nikolaidis N, Pitas I. Digital radiograph registration and subtraction: A useful tool for the evaluation of the progress of chronic apical periodontitis. J Endod 2004;30:513-6. 12. 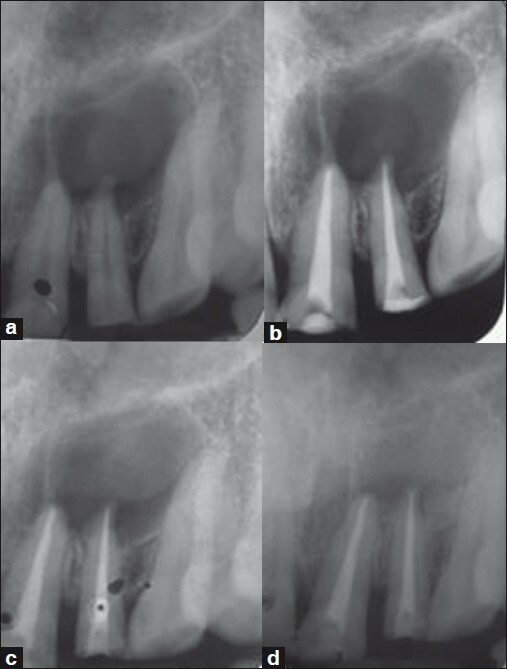 Zakariasen KL, Scott DA, Jensen JR. Endodontic recall radiographs: How reliable is our interpretation of endodontic success or failure and what factors affect our reliability?. Oral Surg 1984;57:343-7. 13. Abu-Serriah M, Ayoub A, Boyd J, Paterson C, Wray D. The role of ultrasound in monitoring reconstruction of mandibular continuity defects. Int J Oral Maxillofacial Surg 2003;32:619-27. 14. Cotti E, Vargiu P, Dettori C, Mallarini G. Computerized tomography in the management and follow-up of extensive periapical lesion. Endod Dent Traumatol 1999;15:186-9. 15. Agarwal V, Logani A, Shah N. The evaluation of Computed Tomography Scans and Ultrasounds in the Differential Diagnosis of Periapical Lesions. J Endod 2008;34:1312-5. Marotti, J. and Heger, S. and Tinschert, J. and Tortamano, P. and Chuembou, F. and Radermacher, K. and Wolfart, S.